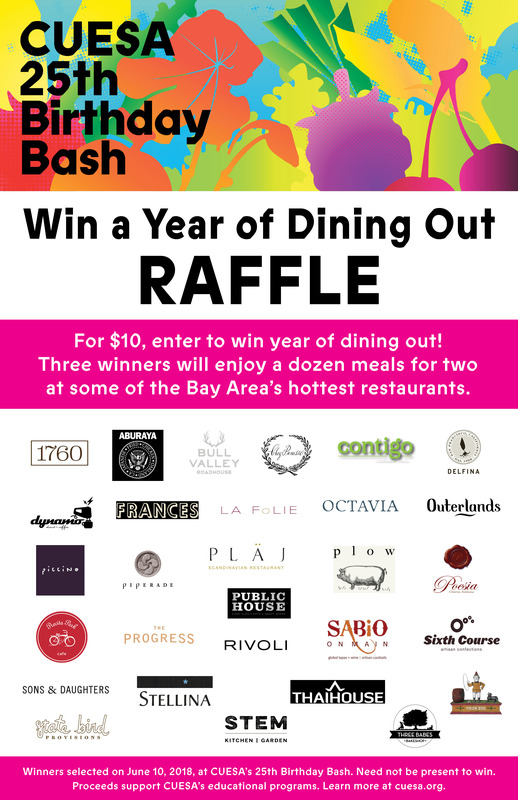 Win a year of dining out at the Bay Area’s best restaurants! Purchase tickets for CUESA’s 25th Birthday Bash Raffle at the Ferry Plaza Farmers Market Info Booth or on the night of the event. Winners will be announced at the Birthday Bash, but need not be present to win. While we would love to sell you a raffle ticket via this platform, California law prohibits it, as it considers online raffle ticket purchases a form of online gambling. So please visit us at the farmers market and join us at the celebration for your chance to win the amazing prizes! We’ll select the winners at the event and announce them in the e-letter the following week; you need not be present to win. Proceeds support CUESA’s educational programs. Participating restaurants include: 1760, Aburaya, Bull Valley Roadhouse, Chez Panisse, Contigo, Delfina, Dynamo Donut + Coffee, La Folie, Frances, Octavia, Osteria, Outerlands, Piccino, Piperade, Plaj, Plow, Poesia, Precita Park Cafe, The Progress, Public House, Rivoli, Sabio on Main, Sixth Course, Sons and Daughters, State Bird Provisions, Stellina, STEM Kitchen & Garden, Thai House Express, Three Babes Bakeshop, Trick Dog, and MORE TO COME! Thank you to all of these businesses and our raffle entrants for generously supporting CUESA!